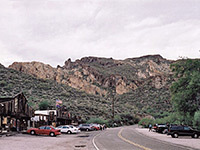 Named after the Apache Indians who once used the route, the Apache Trail, or AZ 88 as it is officially known, links Apache Junction at the edge of the Greater Phoenix area with Theodore Roosevelt Lake, through the Superstition Mountains and the Tonto National Forest; 40 miles of steep, winding and mostly unpaved road past magnificent scenery of twisted igneous mountains with dense forests of saguaro and ferocactus, and several deep blue lakes. Past the lakes, the original route continues in more traditional fashion to the former copper mining town of Globe (via Hwy 188), but it is the western half which is the most scenic and well-known, however caution is required when driving and it is not recommended for large RVs or caravans; the largest RV rental company in the US (Cruise America) does not allow their vehicles do be taken on this route. Driving eastwards along Main Street through Mesa, the hazy Superstition Mountains come slowly into view and it is a relief from the seemingly endless suburbia when the AZ 88 turn-off approaches. The first points of interest are Goldfield, supposedly a ghost town but now rather commercialized, and then the Lost Dutchman State Park - this has information about the varied stories and legends associated with the mountains, and in particular about the Lost Dutchman Mine which was supposedly a tremendously rich gold mine worked by a lone prospector but its location was lost upon his death. 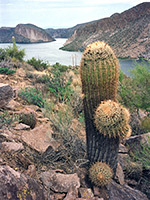 Nearby is the starting point for several trails leading into the Superstition Wilderness. A few miles further, the trail begins to bend sharply as the land becomes steeper, and passes along the shores of Canyon Lake, one of four formed by damming the Salt River, the course of which runs right through Phoenix but is dry for most of the year. Several marinas and one RV site (which used to be quite cheap but 2010 rates appear to be from $25 upwards) provide some facilities - the sites tend to have a lot of mosquitoes but do offer free firewood when, and the location is next to a nice clean beach. 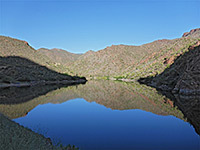 The land around Canyon Lake is typical of the Tonto National Forest area - crumbling, distorted rock with steep cliffs and twisting ravines, without much covering vegetation but with several species of desert plants. Various lengthy foot-trails traverse the wilderness, leading to remote springs and canyons, such as Fish Creek and La Barge Canyon. Continuing east, the old-west style settlement of Tortilla Flat (population 6!) is reached - this has various ancient mining and agricultural relics, and an interesting curio shop decorated with mementos from the many visitors who have passed through over the years. Three miles east, the road passes above a short slot canyon with pools and dryfalls, which may be explored in less than an hour. The road fords Tortilla Creek - a crossing that may be closed during high water levels - then soon after, the paved section ends and a narrow gravel track continues for a further 28 miles above the larger Apache Lake, to which access is more limited, and eventually to the Theodore Roosevelt Dam - this was built of bricks in 1911 and remains the world's largest masonry dam at almost 300 feet tall. It is a major element of the Salt River Project which has facilitated the expansion of Phoenix and its environs. The dam seems to be in a state of near-continuous repair or alteration. A few miles south of the dam and along the shores of Theodore Roosevelt Lake, a short side road leads to the preserved cliff dwellings of Tonto National Monument. 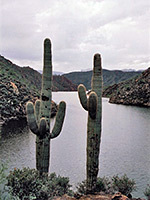 Further south, there are more marinas along the lakeside before the Apache Trail climbs steadily for 15 miles through more cacti-covered hills and past a few small settlements towards Globe. This is an interesting town, established in 1876 after a large globe-shaped boulder of silver was found nearby. Both copper and silver were later mined extensively, and several old buildings remain from the boom times around the turn of the century. A few miles west, huge copper ore extraction operations still continue around Miami, and US 60 passes several miles of tailings ponds and spoil heaps. The 246 room Holiday Inn Hotel & Suites Phoenix-Mesa/Chandler provides good value accommodation right next to US 60 in Mesa (1600 South Country Club Drive), about 20 miles from the start of the Apache Trail at Apache Junction. The hotel is only a few minutes drive from Phoenix Sky Harbor airport and is famous for its huge outdoor swimming pool. There are many other hotels close to the Apache Trail including in Apache Junction, Gilbert, Mesa and Scottsdale in the west, and Globe in the east.